Terry says they came up with the synthetic (bamboo) panels and awning fabric to create an outdoor room, defining the space itself which provides a light airy feeling. 8 woven synthetic bamboo panels, 4 on each side were staggered back and forth with slide bar awnings over the top. 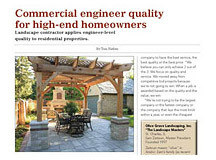 Pacific Outdoor Living often does slide awnings underneath pergolas. The 4” x 6” steel tubing supports were fabricated by one of their regular subcontractors that also does their gates, fencing and wrought iron work. The supports are bolted down to 3’ x 2’ concrete footings. To create the awning fabric and bamboo panels, they looked to Tidelli, a Brazilian furniture company they had met through a previous Pasadena Showcase House of Design. Tidelli also provided the furniture. And the winner of the first ever Residential Porcelain HNA Project Award is …. Pacific Outdoor Living’s installation at the 2017 Pasadena Showcase House of Design. 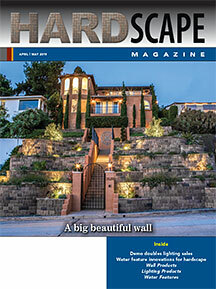 The project also won a 1st place porcelain project award from Belgard. Terry says the annual House of Design is typically held at a 10,000 sf residence with a couple acres of land. This house belonged to a member of the Anheuser Busch family. 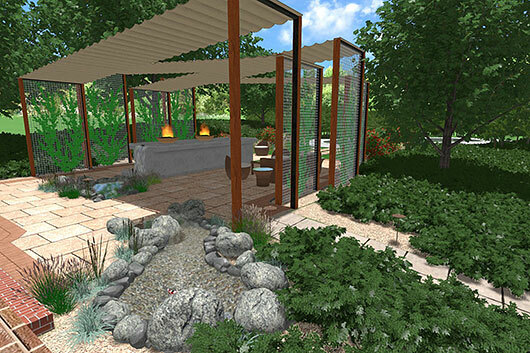 7 to 12 landscape contractors/landscape designers each renovate a section of the property to market their work to up to 30,000 people who tour the place over the course of the 4-week event. Interior designers remodel rooms in the house. Unlike a home show, exhibitors don’t pay to be included. Instead, contractors/designers compete to participate. They have to submit a conceptual plan and go thru an interview process. Winners are chosen by a committee. Proceeds from the show support music in the community. 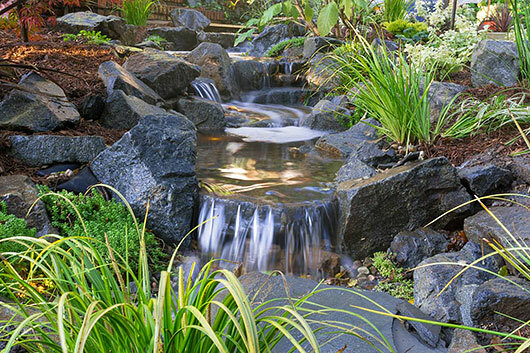 The waterfall off the table flows into a small pond. From there it appears to flow beneath 5-1/2’ of porcelain pavers to the stream pictured below. For 2017 Pacific Outdoor was assigned a fairly open area of the property that Terry wanted to transform into a sleek and modern room setting. It also needed to be an attention getter. “We like to do something dramatic for the show. So, we came up with the idea for the awning and then the 15’ table. It's a huge table. And, not just a table. Let's do a stream down the middle of the table, and a waterfall. Terry says Belgard donated the Mirage porcelain pavers, and his subcontractors that contributed did their work at cost. 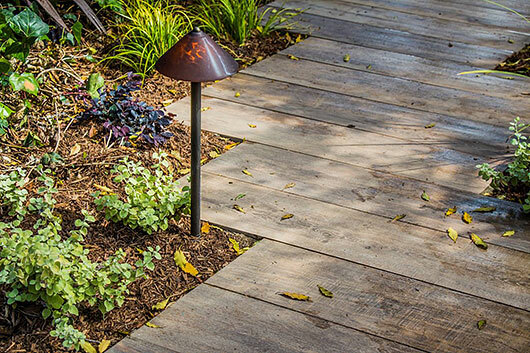 Pacific Outdoor’s crews do most of the work. Terry says they compare the cost per sale of each of their marketing efforts. 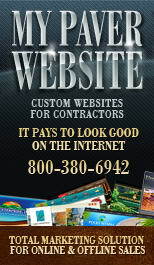 “This show is comparable to pay-per-click and to a home show. It’s far better than post card mailings. But the best thing about this is that we get good leads continually for 4 weeks. And, we still get leads from people that came to the Showcase 15 years ago. Pacific Outdoor hires temporary staff who are good communicators to serve as their on-site reps. The staffing cost comes to about $7,500 of the total with 2 people on site for 48 hours a week each x $15/hr plus bonuses paid for each lead that turns into a sale. 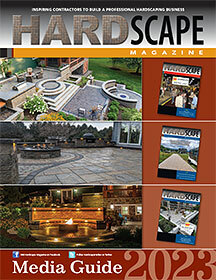 After the show, they always leave the hardscape, built-in water features and any plants smaller than 1 gallon. This year they also left the table. They recoup a bit of the cost by selling off whatever else they can from the installation. The homeowner bought about $7,000 worth of materials, mostly lights and larger plants. They sold the awning to a customer 50 miles away for $7,500, but it cost about $3,500 for the subcontractor to move and reinstall it. Once they remove everything they plan to remove, they are required to return the area to at least its original condition. 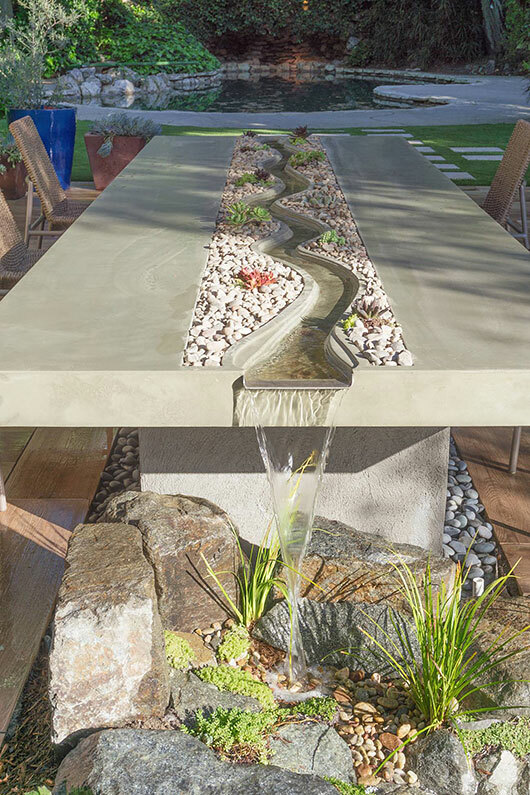 The stream was molded into the precast concrete tabletop by a subcontractor called Five Feet From The Moon. The company fabricates a lot of Pacific Outdoor Living’s outdoor kitchen countertops and table tops. 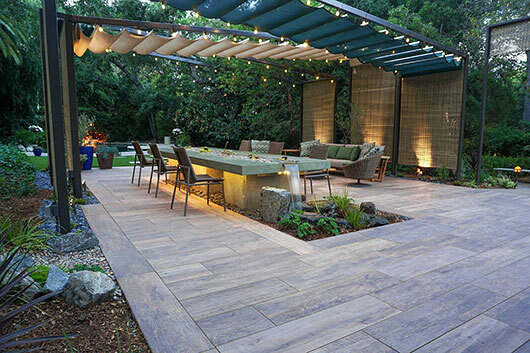 Terry says planks are becoming their most popular porcelain paver though they still sell more 2’ x 2’ porcelain pavers. They install porcelain much the same as they do concrete pavers. But, with no freeze/thaw issues in their area, they use concrete to hold the border pavers. First they install a standard base, sand setting bed and pavers. Then they pick up the border pavers and install a concrete bond beam 8” wide x 8” deep around the perimeter. The border pavers are then wet set into the concrete border.